The nomination authority and the awarding structure of Motivational Strips will be delegated between the Chief Advisors, Founders of affiliate forums, Administrators and moderators. 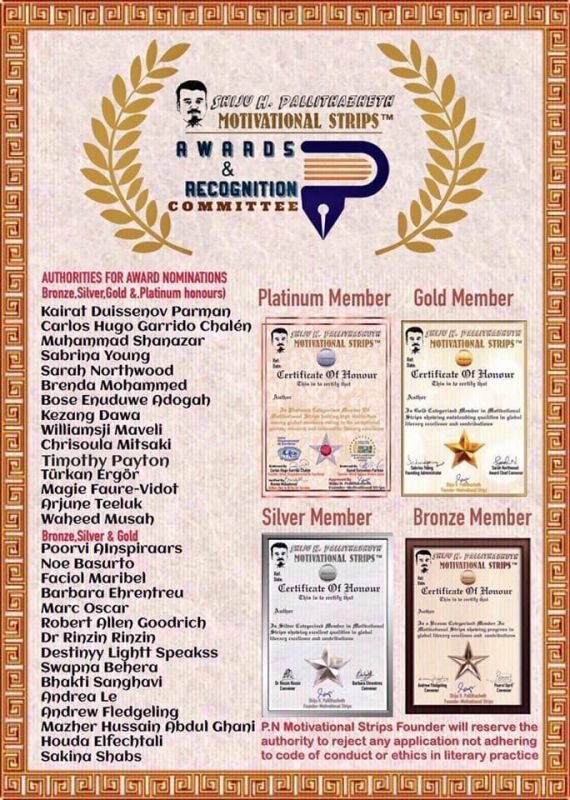 However to be eligible for such nomination, the nomination has to be approved by the Founder of Motivational Strips and accompanied by a bio showing reference to exceptional contributions to the forum and global literature. One should be consistently active in Motivational Strips and should be role models encouraging co writers with qualitative inspiration . Bio should show verifiable credentials with outstanding contributions to global literature in terms of verifiable postings and published articles. The back up awards from worthy and respectable organisations will also give weigtage for winning this honour. • Moderators in Motivational Strips. ☑️ Recognition Program Chief Convener Sarah Northwood. The award is given to active and exceptional writers in Motivational Strips wall or the affiliated forums of Motivational Strips. Encouraging co writers in the forum adds weightage for this honour to be bestowed. It should not be crossing one nominee a month in this category per committee member as above. Excellent writers with exceptional activeness in Motivational Strips wall who takes time to post and encourage other writers as well will be eligible for this category honour. Good writers, new members with exceptional activeness in Motivational Strips wall who takes time to post and encourage other writers as well will be eligible for this category honour. P.N All nominations by the respective MSARC members have to be placed to Motivational Strips Founder who reserves the authority to reject an application if the candidate is found found to be against code of conduct or ethics of world literature.